The 5 Best “Can’t Go Wrong” Gifts for Guitarists – and a Few Very Bad Ideas! NEWSFLASH – AMAZON SALE TODAY! CLICK HERE TO SAVE UP TO 71% OFF INSTRUMENTS! OK, so you need a gift for the guitarist in your life huh? Welcome to a minefield of potential problems! 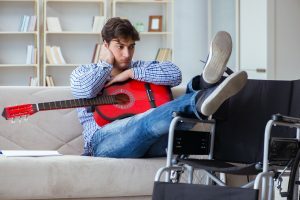 Chances are, you know they love playing guitar, but as far as style, brands, existing equipment, like, hates, taste and preferences – WHO KNOWS, RIGHT? Acoustic? Folk? Electric? Bass? HELP! You want to show your support for their passion and get them a gift that will WOW them? We’ve asked around, and here are some gifts that will NEVER GO WRONG! The best thing about this t-shirt is you can feel safe giving it to someone who plays ANY style! So many of the shirts on the market are only for acoustic or electric. This one, as Goldilocks would say, is “just right”! They pretty much all love it! It comes in different colors, sizes (men, women, and kids) and is 100% cotton – so they can stay cool under the hot lights! Lightweight, Classic fit, Double-needle sleeve and bottom hem – a safe, practical and awesome choice for the guitarist in your life. Check out sizes, colors, and prices here. 2. Epitomie Finger Strengthener – A Must Have! One of the most vital aspects of playing the guitar is the ability to maintain physical strength and dexterity. The Epitomie is the very best reviewed strengthener on the market and they’ll be forever grateful for this thoughtful and useful gift. One of the unique aspects of this product, however, is the 100% money back guarantee. If at any time your guitarist is unhappy with their gift, they may return it for a full refund! How can you go wrong? One of the biggest problems for a guitarist is making sure their guitar stays safe! Yes, they may already have a stand at home, but what about when they go to a friend’s house for a jam, or travel to a gig, or go on holiday? This sturdy, aluminum alloy and silicone rubber stand works a treat to ensure your guitarist’s precious instrument remains undamaged – anywhere they may choose to go! We are super impressed with the quality and we know your gift will be well received. There’s always room for another guitar stand! 4. Pick-a-Palooza – Make a Guitar Pick out of Any Plastic! Pick-a-Palooza – Simple to create your own pick or plectrum out of ANY piece of plastic – at home or on the road! Has anyone seen my guitar pick? Where did I leave it? Are they in the car? Upstairs? Can you lend me one of yours? Any guitar player knows the frustration and embarrassment of being “pick-less” when they need them most. This gift will help your loved one avoid one of the biggest frustrations of guitar playing. They’ll be forever grateful to be able to instantly create a pick out of ANYTHING – just lying around! An old drivers license, a credit card, plastic packaging and more! They will never be pick-less again. This acclaimed system allows your family member or friend to create loads of picks to store everywhere they might need them. In seconds, they can “print” another one – then get on with the job of creating great music in minutes. Give the gift of 1,000 personalized picks – what guitarist wouldn’t want a custom pick of their choice made over and over again? Guitar players love music. It’s the reason they started playing in the first place. But what most people don’t know is that it’s possible to damage your hearing from just ONE SESSION of loud music. Even if they play acoustic, they probably listen to loud music and attend concerts at which the music is much too loud for the human ear. Why do they have it so loud? Who knows. But with this caring and thoughtful gift, you can help them avoid the number one complaint of older musicians – hearing damage or loss. Find out more here. a) You avoid giving them something to do wwiththe guitar, because you have NO CLUE about what they have or don’t have already. c) You DO decide to get them something guitar related because you care about them and want it to be a special gift… BUT please read the below BEFORE GETTING ANYTHING! The 3 WORST Gifts Guitarists Tell Us They Are Given ALL THE TIME! 1. Books, magazine subscriptions, and CD/DVDs. If you really want to do the right thing by the guitar player in your life, you’ll follow the above rules and stick to gifts that don’t make assumptions about their playing level, style or preferences. They will appreciate your support and tthoughtfulnessif you take the time to research just a little BEFORE you buy. All the best and keep up the support! PreviousPrevious post:Revealed! The 6 Best Gifts for Singers under $50 – and 4 of the WORST!NextNext post:The Best 7 Gifts for Drummers of ANY Age and Skill Level – and 3 Bad Gift Ideas to Avoid! Revealed! The 6 Best Gifts for Singers under $50 – and 4 of the WORST! The Best 7 Gifts for Drummers of ANY Age and Skill Level – and 3 Bad Gift Ideas to Avoid!